Switch the ignition to ACC or ON. Press the power/volume dial to turn the audio system on. Press the power/volume dial again to turn the audio system off. To adjust the volume, turn the power/ volume dial. Turn the power/volume dial to the right to increase volume, to the left to decrease it. 1. Press the audio control dial to select the function. The selected function will be indicated. About 5 seconds after selecting any mode, the volume function will be automatically selected. 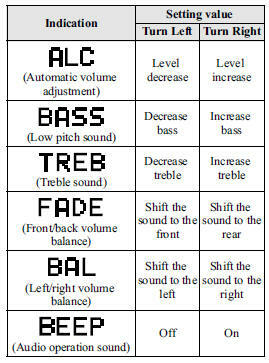 To reset bass, treble, fade, and balance, press the audio control dial for 2 seconds. The unit will beep and “CLEAR” will be displayed. The automatic level control (ALC) changes the audio volume automatically according to the vehicle speed. The faster the vehicle speed, the higher the volume increases. ALC has ALC OFF and ALC LEVEL 1 to 7 modes. At ALC LEVEL 7, the amount that the volume can increase is at the maximum. Select the mode according to the driving conditions. Successively pressing the band selector button ( ) switches the bands as follows: FM1→FM2→AM. The selected mode will be indicated. If FM stereo is being received, “ST” will be displayed. If the FM broadcast signal becomes weak, reception automatically changes from STEREO to MONO for reduced noise, and the “ST” indicator will go out. Turning the manual tuning dial will change the frequency higher or lower. higher or lower frequency automatically. The 6 preset channels can be used to store 6 AM and 12 FM stations. 1. To set a channel first select AM, FM1, or FM2. Tune to the desired station. 2. Depress a channel preset button for about 2 seconds until a beep is heard. The preset channel number or station frequency will be displayed. The station is now held in the memory. 3. Repeat this operation for the other stations and bands you want to store. To tune one in the memory, select AM, FM1, or FM2 and then press its channel preset button. The station frequency or the channel number will be displayed. This is especially useful when driving in an area where the local stations are not known.
) for about 2 seconds until a beep is heard; the system will automatically scan and temporarily store up to 6 stations with the strongest frequencies in each selected band in that area. stations. One stored station will be selected each time; its frequency and channel number will be displayed. If no stations can be tuned after scanning operations, “A” will be displayed. If a disc has both music data (CD-DA) and MP3/WMA/AAC files, playback of the two or three file types differs depending on how the disc was recorded. Insert the CD into the slot, label-side up. The auto-loading mechanism will set the CD and begin play. There will be a short lapse before play begins while the player reads the digital signals on the CD. the CD will load and play. turn the file dial clockwise once to skip forward to the beginning of the next track. turn the file dial counterclockwise within a few seconds after playback begins to track down to the beginning of the previous track. turn the file dial counterclockwise after a few seconds have elapsed to start playback from the beginning of the current track.
) to advance to the next folder. This function scans the titles on a CD and plays 10 seconds of each song to aid you in finding a song you want to listen to. the scan play operation (the track number will flash). If the unit is left in scan, normal playback will resume where scan was selected. Press the repeat button (1) during playback to repeat the playback of the current song. “TRACK RPT” is displayed during playback. Press the repeat button (1) while displaying the “TRACK RPT” to cancel. Press the repeat button (1) two times while displaying the “TRACK RPT” to cancel. Press the repeat button (1) two times during playback to repeat the playback of the current song in the folder. “FOLDER RPT” is displayed during playback. Press the repeat button (1) while displaying “FOLDER RPT” to cancel. Press the random button (2) during playback to play the tracks in the CD randomly. “DISC RDM” is displayed during playback. Press the random button (2) while displaying “DISC RDM” to cancel. Press the random button (2) during playback to play the tracks in the folder randomly. “FOLDER RDM” is displayed during playback. Press the random button (2) two times while displaying “FOLDER RDM” to cancel. Press the random button (2) two times during playback to play the songs on the CD randomly. “DISC RDM” is displayed during playback. 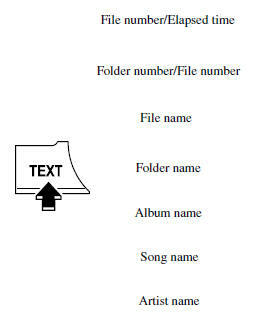 For files with a file name and other information that have been input, the display switches between display of the file name and other information each time the text button ( ) is pressed during playback. 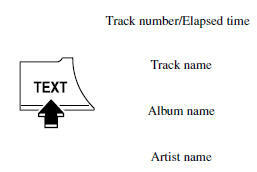 • The information viewable in the display is only CD information (such as artist name, song title) which has been recorded to the CD. • This unit cannot display some characters. Characters which cannot be displayed are indicated by an asterisk ( ).
) again after the last 13 characters have been displayed to return to the beginning of the title. The number of characters which can be displayed is restricted. If “CHECK CD” is displayed, it means that there is some CD malfunction. Check the CD for damage, dirt, or smudges, and then properly reinsert. If the message appears again, take the unit to an Authorized Mazda Dealer for service. Audio can be heard from the vehicle's speakers by connecting a commerciallyavailable portable audio unit to the auxiliary jack. Use a commercially-available, nonimpedance (3.5 ) stereo mini plug cable. Contact an Authorized Mazda Dealer for details. 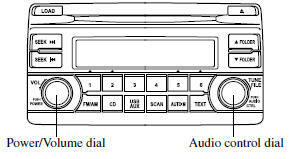 In addition, audio can be played from the vehicle audio device by connecting USB memory or an iPod to the USB port. Refer to AUX/USB/iPod mode on . If you see an error indication on the display, find the cause in the chart. 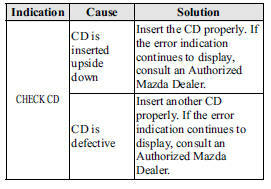 If you cannot clear the error indication, take the vehicle to an Authorized Mazda Dealer.